I finished all the butterflies. All the major stitching is done now. There is, in the pattern, a large empty space below the large butterfly. I debated just adding something but this is how the design is so I'm leaving it. The next step was to add the butterfly bodies. That was simply taking a full section of thread and doing a straight stitch. 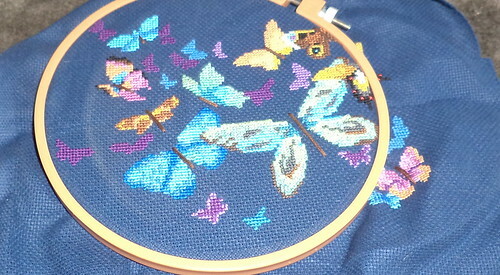 Now that this is done, I need to outline some of the butterflies. Not all of them get that treatment. I also need to figure out where to put my initials and the year. There is a box that goes around the design, pulling it together. I might "sign" this project near the box. 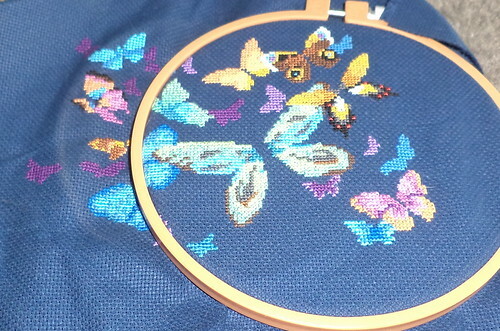 Adding the bodies made the butterflies look so much better. It will be exciting to see how much more distinctive they become with outlining.